What ever did we do without the cordless power tool? Spent most of yesterday, in the glorious weather, floating around on the quad, tools in hand, fixing gates and stuff all over the farm. The drought and then he wet of last year has played havoc with all things wooden at Toft Alpacas so there's an awful lot of bodging to do for truly. 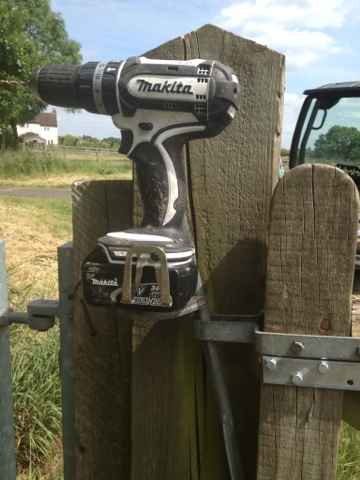 How it would be possible without my trusty Makita I can no longer imagine. God bless the man or woman who first designed the cordless drill! EBit of a surprise this week when Toft Linseed not due until the 17th of August suddenly went into labour and produced a wee brown girl only 4.06 kg. She's perfectly formed if a little weak but feeds off mum. She was however a little too weak to stand and feed for too long. So we have kept her penned outside and in all week to save her walking too far to Mum. 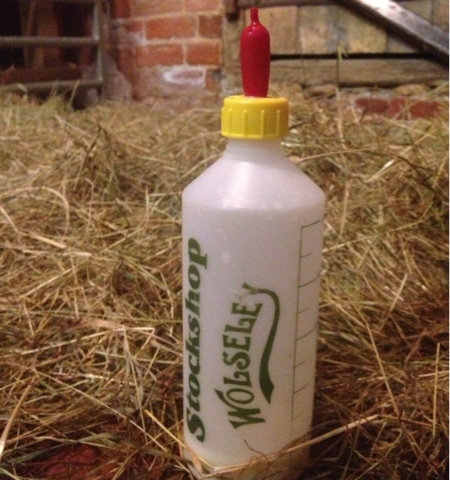 Kept a coat on her to preserve what little energy she has and we have been supplementing her natural food with the bottle. And....? Well it's still early days. So early in fact that we don't dare give the wee girl a name. But she seems to be getting stronger and is standing longer and his morning when I checked her early doors she had a full tummy. So things are looking good but I feel it will be some time before we can chance our arm and give her a name. If she makes it through then maybe 'Toft Survivor' would be fitting. It's compulsory at his time of the year for yours truly to be in a pen with some pet males at the local village fete entertaining he crowds. It was a great turn out this year. 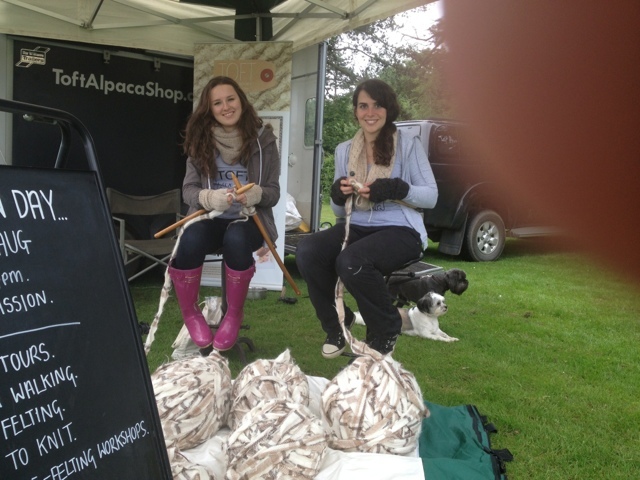 The weather held off until the Fete was over and something like 2000 people went home having stroked an alpaca with answers to their queries. 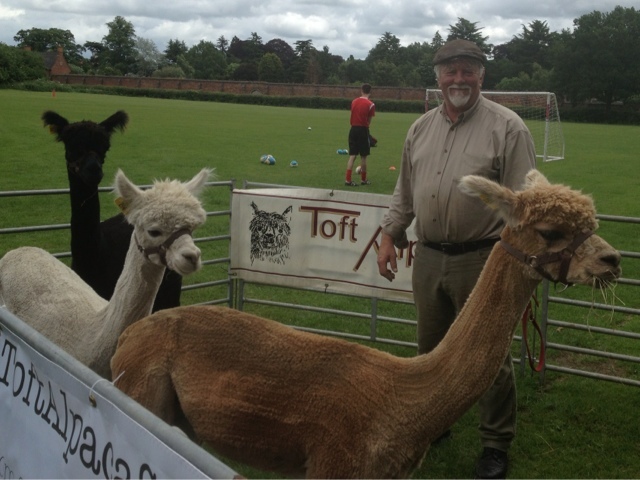 I was accompanied on the stand this year by the 'Toft glamour' in the form of two young female internees Patricia and Safari who did a fantastic job of talking to the people about the Toft Alpaca Shop and promoting the Toft Open Day on August 3rd. I also had two hangers on in the shape of Kerry's comedy dogs - Harvey and Pete who loved the fuss and attention. Lot's of a fun was had by all and a big thanks to my mum in law Myra for the coffee and cake and support. 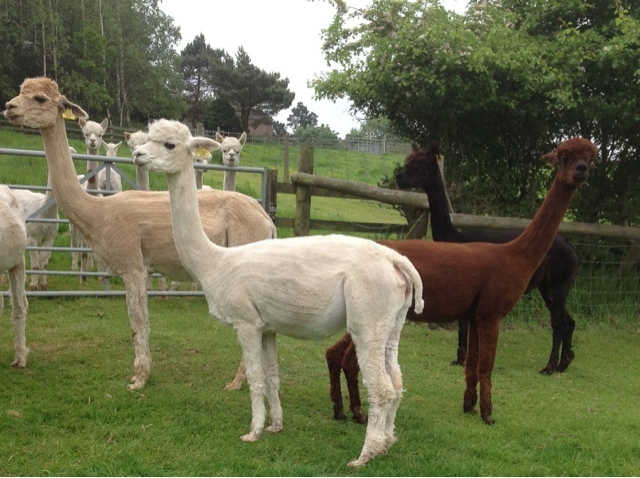 The alpaca maternity paddocks are currently full of the second wave of expectant alpacas all watching the weather looking for the opportunity to unpack their little treasures. It has threatened rain all week with the skies as heavy as the mums so we we have to remain especially vigilant. Luckily my wonderful mother in law who lives in the garden just loves being on cria watch and soon raises the alarm once the action starts. You're a star Mum! Spent yesterday morning assessing the cria crop to date and left inspired. Out of nineteen cria so far only three had average fleeces, eight were exhibiting excellence and the other eight were very good. There's a couple of Toft Jaina Browns that are truly stunning with Elite quality. Unfortunately it started to rain in bath fulls as we finished so there wasn't time for great piccies. 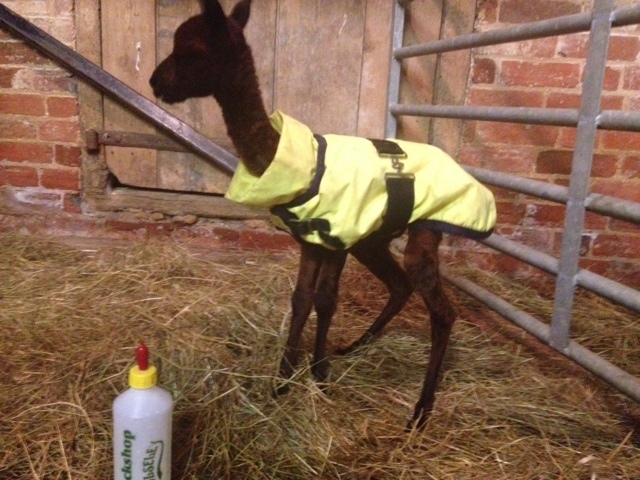 Congratulations to Nigel and Kate Beckwith of Herts Alpacas who today took delivery of Toft Madysen our champion junior female to add to their breeding programme. We wish them every success and hope that Our Champion girl breeds them a long line of Show champions. Only this weekend at the fleece show at Three Counties Show in Malvern Toft Madysen, who already has an impressive show record, took first and champion fawn fleece. We wave goodbye to some stunning genetics but rest easy at Toft knowing one of the finest females we have bred in all our 16 years will start her own family in such a good and caring home. Sometimes we all need a break from alpacas. 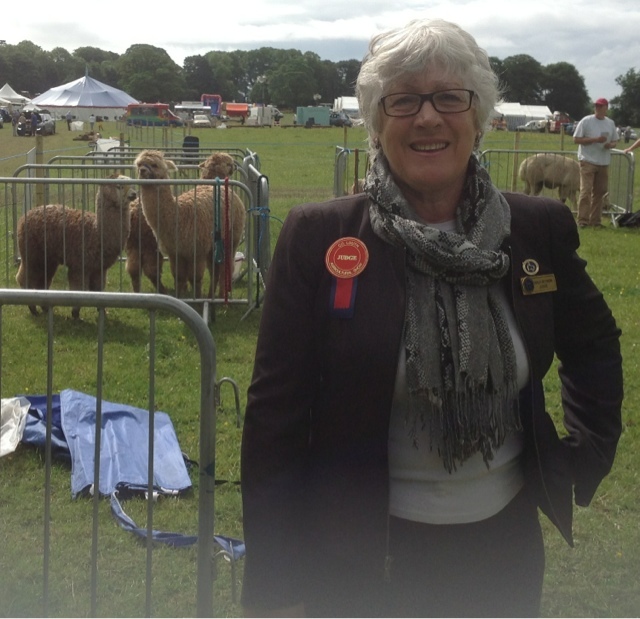 After Shirley judged the alpacas at the Dundalk Agricultural show we stayed in Ireland for most of yesterday. 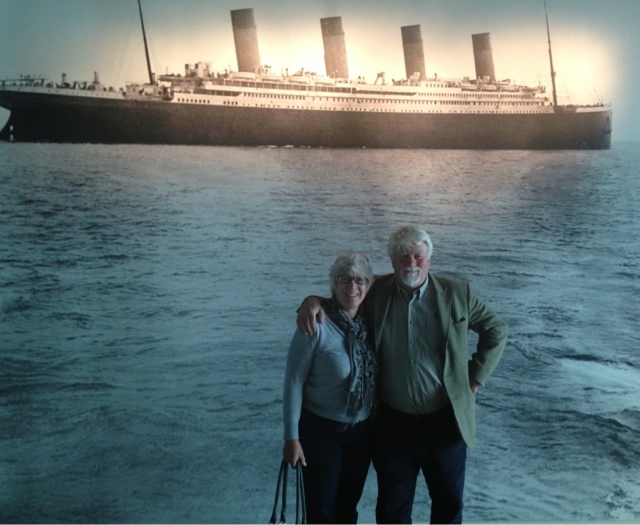 Then after looking over some of our alpacas which are for sale at Mullagh Lane alpacas in he morning we slipped North of the Border with our good friend Bernie Neary to visit the Titanic exhibition in Belfast. It's not an Exhibition as such it's truly much much more. It's a full on extremely modern interactive experience and is one of the most innovative permanent exhibitions I have ever had the privilege of seeing. The av work is truly stunning and almost impossible to photograph as it is constantly moving. We spent two and a half hours engrossed in the Titanic and the history of Belfast and the Harland & Wolfe Shipyard at the beginning of the twentieth century. It was truly inspirational and well worth a visit to Belfast just to see it. We could have spent our hours and would not have been bored - it's that good- really! First halter show completed and Shirley is posing for pickies with her champion and reserve. Both champion and reserve alpaca are owned by Damien Dyar of Burren alpacas who unfortunately could not attend the show but his son on the left and his trusty helper were over the moon with the results. Congratulations to Burren alpacas on a great result. 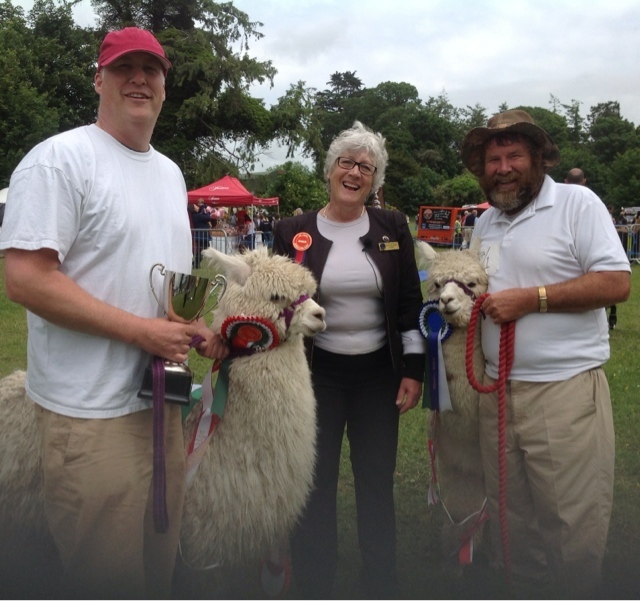 Congratulations to the Dundalk Agricultural show for hosting a charming alpaca event and congratulations to all the members of the Ireland Alpaca Association for their good humour and jot throughout! 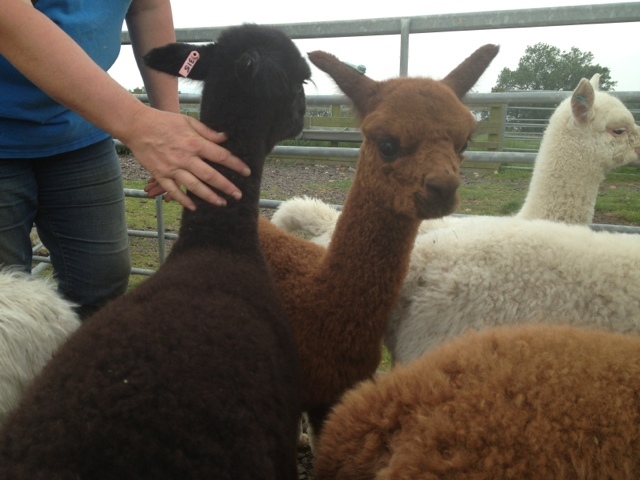 Labels: Alpaca show, Dundalk Agricultural show, Ireland Alpaca Association. 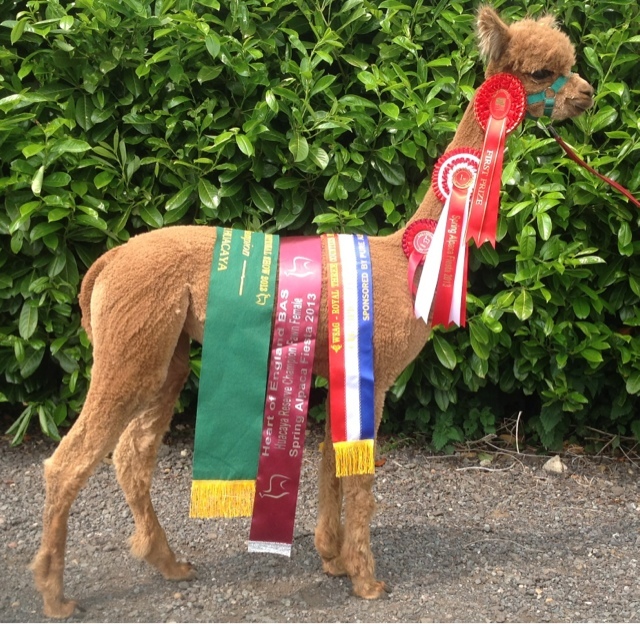 Shirley had a great day yesterday judging her first alpaca halter show at the Dundalk agricultural show in Eire. The weather threatened to give us a soaking from early doors to mid afternoon and then didn't deliver so we got away with it again. She really is the luckiest woman in the world when it comes to weather. If Shirley commands it does not rain, it quivers and cowers and stamps up and down wanting to but somehow never gets up the nerve to go against her wishes. As her trusty 'companion animal' I empathise entirely! 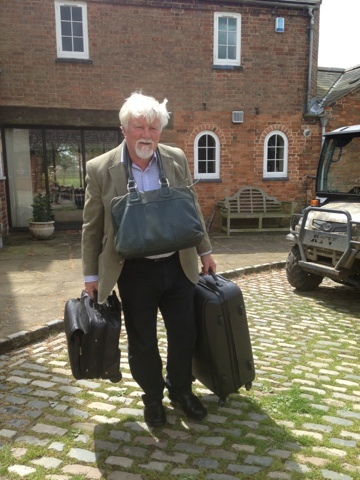 The new British Alpaca Society Judge is taking the reversal in roles this weekend very seriously. Shirley and I are off to the Dundalk Agricultural show this weekend in Eire, where Shirley is judging her first alpaca halter show. 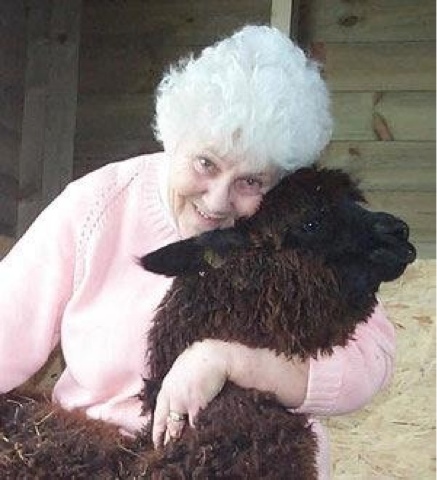 She has been my loyal companion animal for the past ten years as I have judged alpacas all over the UK and Europe. This weekend we swop roles and I shall be hers. However I don't remember Shirley ever carrying all the bags? There's obviously been a bit of a rule change now Shirley is qualified. Seems like the 'companion animal' has suffered a demotion to the role of Donkey or the new BAS Judge is pulling a fast one. I'll find out which as the weekend progresses! Introducing Toft Timogen only three days old when this was taken but already one can see in his fleece the potential of his pedigree. 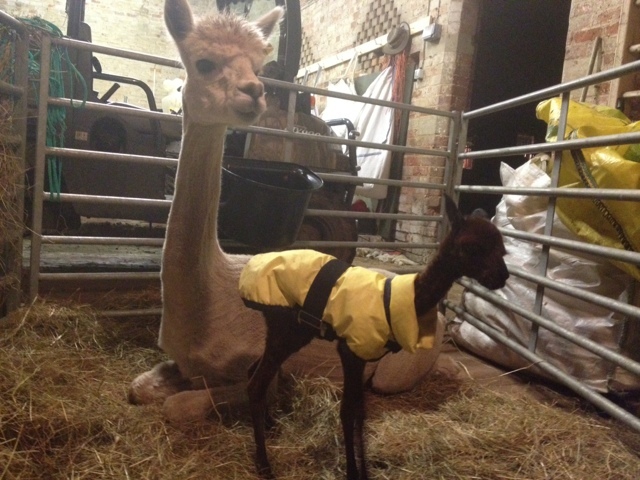 Toft Timogen is the first cria out of our champion fawn girl Toft Nashira. We were hoping for a stunning boy with stud potential so that we can put her fleece right across the herd. We also wanted a darker boy if at all possible. Such things dreams are made of but sometimes they just come true. 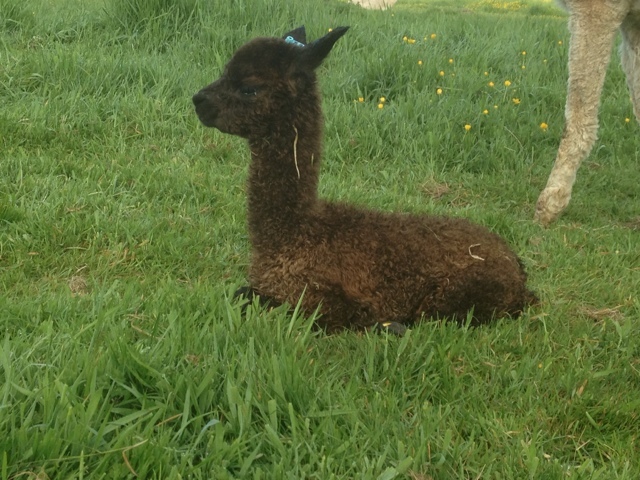 If this alpaca boy grows into the potential that he is showing now then he will be a very important addition to the Toft Breeding programme in years to come. There's a long time between now and conformation of that hope, and it doesn't do o get too excited but sometimes after 16 years of breeding alpacas you can just sense that the signals are very right. The Toft pedigrees are starting to produce in spades and I can't sleep thinking about the births to come. 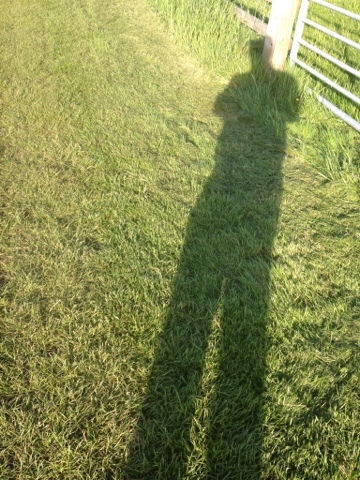 I've been followed all week by this long tall fella I hardly recognise, it has been so long since I last saw him. The frustrating thing is when he arrives we have to get so busy sorting the fields out I never have time to enjoy his company and get acquainted. Now we have fertilised, harrowed and cleaned most of the farm and the first wave of alpaca births is done we might get a chance for a sit down and a quiet chat while we listen to the grass grow but I have a terrible feeling the long tall fella is already bored and is going to disappear for a while- again!! Hey ho maybe next time. Enjoy him while he's here! !